CODAP – Colegio Dominicana De Artistas Plasticos. / Dominican College of Fine Artists is having their 37 Year Anniversary! On Friday October 16, 2014 is a major exhibition with Peruvian Art Masters Wilfredo Navarrete Arellano, David Huaytalla Dionicio, the Grand Master of Color Enrique Galdos Rivas and Victor Salvador Portuguez. You can see the art exhibition inside the college starting at 7PM. 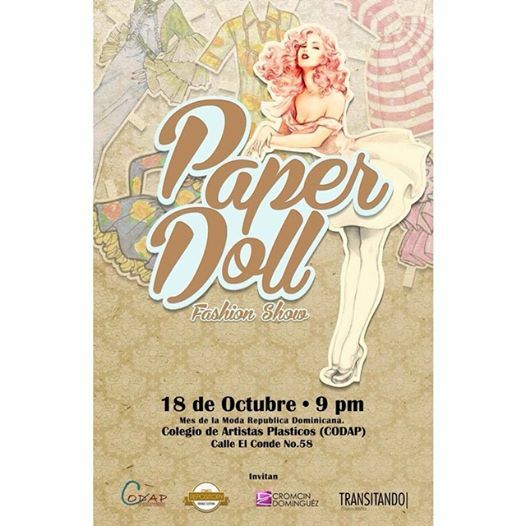 On Saturday October 18, 2014 is the Paper Doll Fashion Show celebrating the month of Dominican Republic Fashion with fashion, music, dance and lots of art/ el mes de la moda de República Dominicana con moda, música, danza y mucho arte. The presentation will be on Calle el Conde in front of the college starting at 9PM. The art school is located on Calle el Conde # 58, on the corner of Calle Isabel la Católica, Colonial Zone, Santo Domingo. See the map of Colonial Zone. Events anniversary, celebration, CODAP, Colegio Dominicana De Artistas Plasticos, College of Fine Artists, exhibition, fashion. permalink.